Home / Scottish Brick and Tile Industry / Boghead Brick and Fireclay Company, Bathgate, West Lothian. Boghead Brick and Fireclay Company, Bathgate, West Lothian. 1889 – Boghead fireclay works, Bathville, initially owned and operated by Gillies Brothers until the Muir takeover in 1915 from when it operated until 1928. 15/04/1893 – Dundee Courier – The Boghead Brick and Fireclay Company – the object of this Company is to purchase the business and plant of Gillies Brothers, Brick and Fire Clay Manufacturers, Boghead, Bathgate and carry it on in the same or an extended form. Capital £3000 in £1 shares. Registered Office – 21 St Andrew Square, Edinburgh. 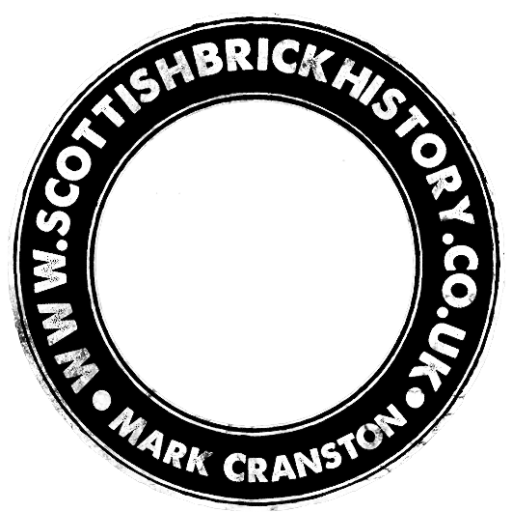 15/04/1893 – Glasgow Herald – further details of the subscribers – G.Gillies, Brickmaker, Bathgate; R.Lynn, Dowanhill, Glasgow; R.C.S.Bruce, Jewel case maker, Edinburgh; A.B. Bruce, Goldsmith, Edinburgh; G. Mill, S.S.C, Edinburgh; W.R.Mann, Steel Founder, Leith; P. Fairweather, Butcher, Edinburgh. 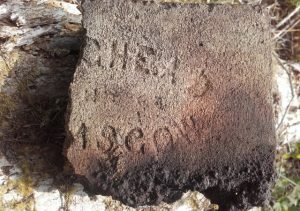 Below – 1896 – Boghead Brick and Fireclay works. 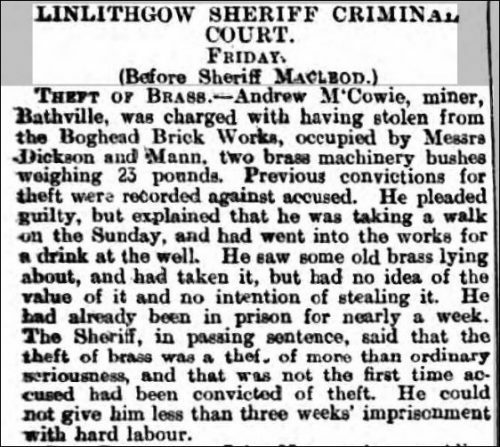 Below – 16/07/1898 – Linlithgowshire Gazette – Theft of brass. Below – 17/05/1901 – Linlithgowshire Gazette – Boghead brickworks opening additional works. 1903 – Robert Muir & Co Ltd – (composition & fireclay brick manufacturers, red & white composition bricks, boiler blocks, flue covers &c.), Armadale, Barbauchlaw, Boghead & South Broadrigg brick works, Armadale station, Linlithgowshire. 16/06/1905 – Linlithgowshire Gazette – The drought is having some effect now on the public works. The want of water has thrown a number of workers idle at one brickworks at Boghead, where the boilers are fed from a small burn that has become dry. 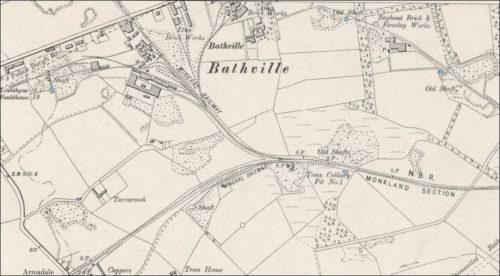 05/10/1906 – Linlithgowshire Gazette – Robert Muir & Co of Armadale, Barbauchlaw and Boghead brick works are about to become mine owners, insomuch as they are going to open a clay mine in the vicinity of their Barbauchlaw brick works at the East end of the town. 08/01/1909 – Linlithgowshire Gazette – Our County in 1908 – ….The foundries and brickworks are not so busy as usual and could do with a great deal more work. 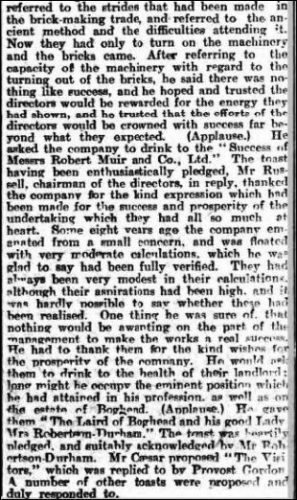 Messrs Robert Muir & Co owners of Armadale, Barbauchlaw and Boghead brickworks having been at law with the United Collieries Company regarding their lease of South Broadrigg brick works had their case settled in their favour in the House of Lords early in the year and resumed operations at the works on the 4th July. 24/09/1909 – Linlithgowshire Gazette – New Management at Muirs Brickworks – Hugh Goldie, who has managcd the brickworks and coalmine of Messrs Robert Muir and Ltd., for past three years, having accepted an engagement of similar nature Bonnybridge, left on Wednesday of last week. In order to fill the vacant position. Messrs Muir and Co., who own Armadale. Barbauchlaw, and Boghead Brick and Pipe Works, and Coal Mine, have had to engage a manager for the brick and pipe works, and also a manager for the mine. Mr James Gillespie, late of Turner and Co., Portobello, took up the duties of managing the brick and pipe work on Tuesday, and Mr Heaps, from Blackbraes, a young certificated mine manager, has taken over the management the mine. Below – 25/08/1911 – Linlithgowshire Gazette – Drought causes local firms to unite in order to construct a pipeline to bring in water – United Collieries, Etna and Atlas brick works, Robertson and Loves Pipe and Can Works. Robert Muir and Co’s works at Boghead brick works will be disadvantaged as they will not be connected to this new supply but their Armadale Barbauchlaw Works may be able to secure a supply of water from their own resources. South Broadrigg Brickworks, Blackridge, West Lothian. Bartonshill Brick Company, Bargeddie, Glasgow.